Hunting, Fishing & Water sports Year Round "The water IS back..."
From the Boone to Winyah Bay. I was viewing your website this morning. Nice site. I saw your invitation to send photos of fish caught from Highrock Lake so here’s a couple catfish I caught from my kayak. 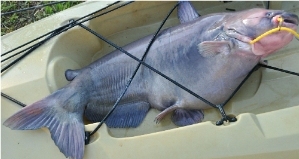 The Blue-cat was caught about 10 days ago in the evening and the Flat-head was caught in September last year at daybreak, 2010. I was using Threadfin shad with both catches. The Blue was about 28 lbs and the Flat was almost 50 lbs. 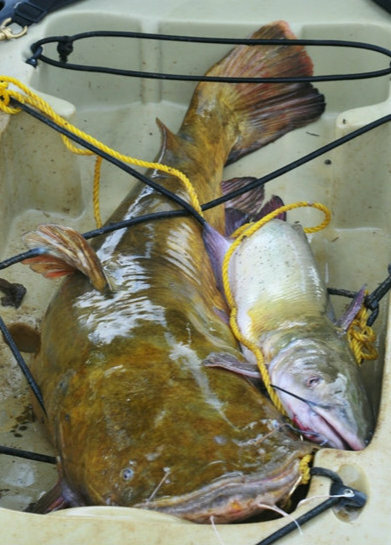 That’s a 22” Channel-cat beside the Flathead. 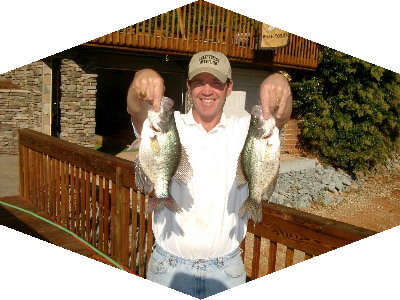 Started fishing High Rock when my Nephew, Johnny Green, (in the picture) bought a house there. It has been pretty good for us. 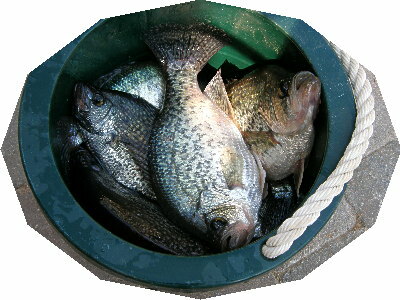 I think the lake has a good stock of Crappie. The fish weighed 35lbs and was 41 1/2 inches long, live bream for bait. caught and released in Abbots Creek on our dock. 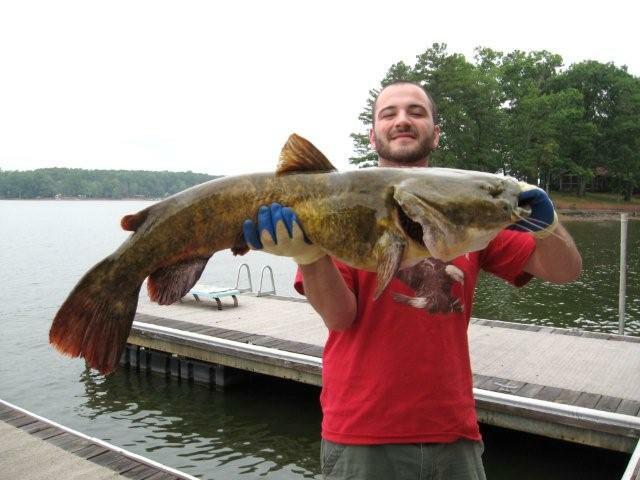 I caught this fish ( 52 POUNDS AND 47 INCHES LONG ) using live bait ( SHAD ) in the upper parts of High rock lake . this fish took me and my friend TONY by total surprise.. tony was holding a landing net and when this things head came to the top , Tony looked at the net , then to me, and quickly threw the net aside... then he reached down to get it by the gills. but this fish had other plans .. it took about five times trying to gill this fish before Tony finally grabbed a good hold and pulled it into the boat... I took this fish home to take pictures and then returned it into the Yadkin river at York Hill landing ... after being out of water for almost an hour and just being wet down with a hose this fish didn't even look back as it swam away into it's new found home.. GREAT things are always found fishing in HIGH ROCK LAKE !!!!!!! Labor Day 2007. Fishing off the dock at his grandparents house on Hickory Point on HRL, 10 year old Mr. Malcolm Lawrence hooked and landed this 2 ft long monster cat on his first cast using some catfish dough balls. He released it soon after. This was the first fish he had ever caught and he was busting with pride. Picture taken by Kathy Lawrence. 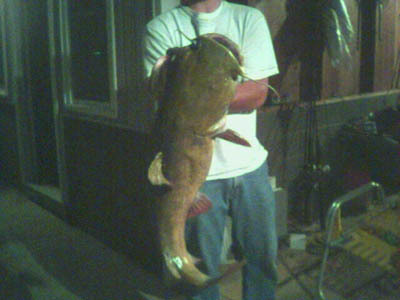 Matt Idol caught this 34lb flathead on 7-7-07 at 4am. Took about 10 min to get this cat in. Caught in Abbotts Creek, released back into the lake. This large mouth bass was caught by Chris Phillips on the Davidson County side of High Rock Lake. It measured 29 inches long and weight was 8 pounds 3 ounces. We released it back into the lake as we felt the fish deserved to live on. Hope you enjoy seeing it. This is a Largemouth that I caught April 27 2007 in High Rock Lake. It was a great day on the lake and after the picture was taken, I returned him to the water for the next person. CHECK OUT THIS 62 LB. CATFISH THAT TOOK 1 HOUR AND 7 MIN TO GET TO THE PIER ON 14 LB TEST LINE. THIS MONSTER WAS 28 INCHES ROUND AND 44.5 INCHES LONG.. CANâ€™T TELL YOU WHERE THE HONEY HOLE IS, BUT THIS ONE IS ONLY ONE OF 5 MONSTERS WE CAUGHT THIS YEAR. My friend and I love to catfish as you can see. So we thought we would send you a few pictures to show what progress has been made in the world of Sheets bottom. There are a total of 23 keepers none under 3-lbs AND ALL CAUGHT IN 24 HOURS. Debbie caught this 13 3/4 lb carp in June 2006 around 8:30 a.m. on corn. Fish was released back into the lake by daughter, Robyn. Michael caught this 40 pounder recently at York Hill landing. Gary sent in these pictures of massive fish caught off his pier. Fish were released. Here is two days of crappie fishing at High Rock lake this Jan.28 and Feb 1st.My buddy (Kevin Hancock) and myself (Tommy Andrade) caught plenty of fish and filled our limit including this 2lbs 13oz crappie I caught on Feb. 1st. 2006. That fish is 17"s long. Great job Kevin & Tommy. Amber Idol of Winston Salem caught this 17 lb carp in Abbots Creek 1/28/06, this hoss was released back in the lake. I was down to visit this past Feb. I live in central Oh. And our lakes were still iced over .The fish were caught on crank baits around docks. The pictures were taken at the Dutch second creek launch area. 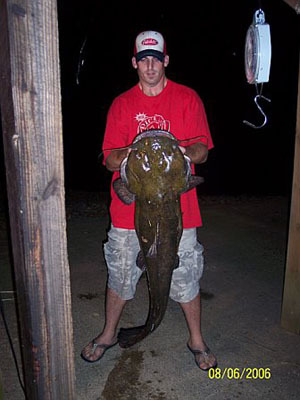 Matt Idol of Winston-Salem caught this 28lb flathead catfish Sept. 4 2005 in Abbots Creek.....Here KITTY KITTY KITTY!!!! Catfish caught on Abbotts Creek by Gary Brown, 48 pounds, He caught it, snapped the picture and released it back into the lake.